The landlord only employs young eastern European female bar staff. Unfortunately they tend to be rude, obnoxious and incapable. Have been drinking here for many years. Unfortunately it has gone too far downhill in recent months. 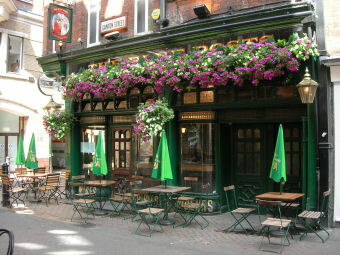 Other reviews suggest this is a typical London pub. It's not. Whatever charm it once had is long gone and it's really nothing more than a filthy unpleasant dump. Not cheap either and all the lagers taste the same. As stated, the main photo above is not the correct one. Image 2 is the correct Blue Posts. I have been in here on quite a few occasions now - and I have to say I quite like it! It is definately a "no nonsense" type boozer with a landlord still wearing a shirt and tie and watching over patrons like a hawk! Beer was "ok" - decor is massively dated, feels like you have gone back 20 years but I find this is actually part of the charm! If you want a proper pub experience go here! If you dont like dated decor and fancy more sumptous surroundings, dont visit. also, thats not the blue posts in the photo above. quailty boozer. 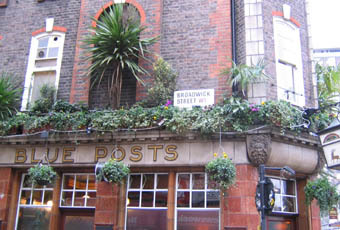 its an authetic english boozer, in a lovely old building, slap bang in the middle of trendy soho. its like an oasis (if you like this sort of thing). carpet form the 1970's, decorations from the 1970's, irish landlord from the 1870's. its such a genuine pub, that passing tourists hoping for some london glamour would open the door, take a look around and leave, all day long. thats not to say it was empty, it was perfectly busy, with a good atmosphere and great service. a lovely pub. one of the nicest features of the building is how it sits, when viewed from broadwick street. the building is much older than its neighbours, and sticks out in a way that shows then original lie of the road. Great little pub always pop in when in the area,staff always friendly and not had a bad pint.